Mergers and Acquisitions offers accessible step-by-step guidance through the M&A process to provide the legal and financial background required to navigate these deals successfully. From the initial engagement letter to the final acquisition agreement, this book delves into the mechanics of the process from beginning to end, favoring practical advice and actionable steps over theoretical concepts. Coverage includes deal structure, corporate structuring considerations, tax issues, public companies, leveraged buyouts, troubled businesses and more, with a uniquely solution-oriented approach to the M&A process. This updated second edition features new discussion on cross-border transactions and “pseudo” M&A deals, and the companion websites provides checklists and sample forms to facilitate organization and follow-through. Mergers and acquisitions are complex, and problems can present themselves at each stage of the process; even if the deal doesn’t fall through, you may still come out with less than you bargained for. This book is a multi-disciplinary primer for anyone navigating an M&A, providing the legal, financial, and business advice that helps you swing the deal your way. Do you know what action to take when you receive an engagement letter, confidentiality agreement, or letter of intent? Do you know when to get the banker involved, and how? Simply assuming the everything will work out well guarantees that it will—for the other side. Don’t leave your M&A to chance; get the information and tools you need to get it done right. Mergers and Acquisitions guides you through the process step-by-step with expert insight and real-world advice. Getting mergers and acquisitions transactions successfully completed requires an understanding of the legal framework, negotiating points, and practical aspects of each stage of the deal. M&As are complex undertakings with lots of moving parts and no end of tricky twists and turns at every stage of the process. This is why, no matter what your role in an M&A, it behooves you to learn as much as you can about their mechanics before entering into such arrangements—or you could come out of it with a lot less than you’d bargained for. 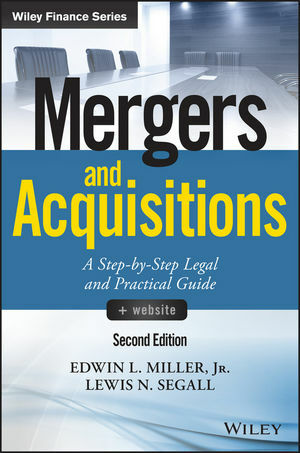 Fortunately, Mergers and Acquisitions, Second Edition makes it easier than ever for you to quickly get up to speed on all the M&A basics. Part legal primer, part business and negotiating how-to, it provides comprehensive, easy-to-digest insights, advice, and guidance for managers, investors, attorneys, and business professionals. Attorneys Edwin Miller and Lewis Segall draw upon their decades of experience orchestrating M&As in both the public and private spheres to school you in the mechanics of M&As. Taking a multidisciplinary, solution-oriented approach, they walk you step by step through the entire process, filling you in on what you need to know about finance fundamentals, structuring transactions, tax considerations, leveraged buyouts, acquiring troubled businesses, and much more. New to this edition of the critically acclaimed guide are discussions of cross-border transactions and quasi-M&A deals like joint ventures, and a companion website providing checklists and sample forms to facilitate organization and concrete understanding. From the initial engagement letter to the final acquisition agreement, Mergers and Acquisitions, Second Edition arms you with the knowledge and tools you need to successfully navigate the M&A process and come out of it with everything you bargain for.